Woodworking presents challenges and different techniques on a regular basis. Often it is as simple as planing figured wood or getting a great fit with a dovetail. Today presents an entirely new challenge cutting a through tenon. I have made plenty of mortise and tenon joints, even some that looked great, but I have never made a through Tenon. Follow along and feel free to critique. The lid of the tool chest is of frame and panel construction. All of the boards are 7/8 poplar and I spent time ensuring they are square and smooth. Laying them on the chest I marked the lengths with my marking knife around the entire board and then used my paring chisel to prep the edge for a first class saw cut. After sawing all of the frame boards to length I cut grooves to receive the panel into each side of the frame boards. I really like using my plow plane to cut these groves. There is something calming in the sound of the plane slicing through the wood and feeling it curl up past my finger tips. In about 15 minutes I have plowed grooves in all four boards and am ready to cut the tenons. I placed the boards on the tool chest again to mark the location of the tenon joints. If you are a 100% hand tool person skip the next sentence. I took each of the frame boards over to the table saw and cut the tenons. After all it was 30 degrees in my shop. Cleaning up each of the tenons with a block plane only took a few minutes and I test fitted in the groove plowed earlier. I’ve been researching making through tenons for the last several days without a Lot of luck. I did stumble across a very neat video from Paul Sellers showing a side view of his method for cutting mortises, this is the method that I intend to use. I also plan on marking the mortise on each edge of the boards and cutting from each side to prevent tear out. Many of my tools are used and have come from estate sales, yard sales ebay, hand me downs etc. I looked for mortising chisels for quite some time, even through the piles of chisels at the Midwest Tool Collector Association and decided to purchase new. Pricing was not much different so last summer I ordered two new chisels from Lie-Nielsen, the first mortise chisels I have ever owned. This was my chance to put them to use making a very deep tenon. The mortise is marked out using my marking gauge and knife being careful to account for any minor differences in the width of the mortise sides. Using my paring chisel I carefully removed material adjacent to the marks then chiseled out the first 1/4 to 1/2 inch. Turning the board over I transferred my marks from the front edge to the back and marked the mortise location in the groove. I could never have done this with a pencil. Taking out my drill I attached a 5/16 auger bit and proceeded to drill out the waste. I drilled within 1/2″ of the mortise on the other side. Next using my mortise chisel and bench chisels I removed the rest of the waste. Well that’s the way it worked in two of the mortises……Fortunately two of them will be covered by the dust seal. 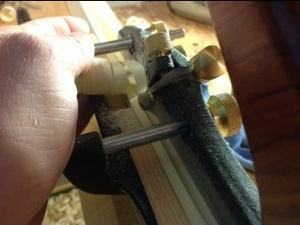 I learned several things along the way; starting the mortise 3/8″ in from the side is two close. I split the side on the second mortise and moved the last two in to about an inch. Take your time on the initial cut. I took twice as long to do the third and the fourth and it shows. Practice..Practice. Next step is the Panel for the lid, dust seal, then glue up. It’s starting to take shape. Thanks for the link. In hind site it probably would have been quicker and more accurate to do the tenons by hand. Finding that in a lot of things.